Last week, me and my family went to Boracay Island for a four-day vacation. We availed of cheap airfare from a local airline and got ourselves a very nice place, close to the beach and the major establishments of the island and the best part is we got it at budget price. If you are vacationing, that is a great place to stay in. For those who are looking to spend a few days in Makati City, where great malls, entertainment and where the country’s business district is located, I suggest Jupiter Suites - a budget hotel in Makati City. This establishment used to be known as Jupiter Arms Hotel, and is located at 102 Jupiter Street Bel-Air, Makati City. This budget hotel in Makati City is situated in the area where bars and restaurants are lined up. Jupiter Suites is just a few minutes away from the shopping malls and the central business district. 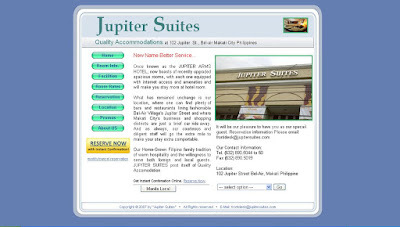 Be a Facebook fan of Jupiter Suites and you can participate in the promotions that Jupiter Suites will launch. Book now and experience high quality but affordable accommodation plus access the internet for free in the rooms – this is part of Jupiter Suites’s standard service. Check this hotel out and spread the word about it.